Bill is a songwriter from the Northeast Arkansas area. He has been writing since about 1970 but did not record til 1981. 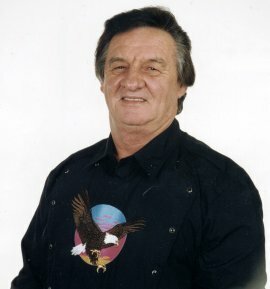 He has been performing around the Northeast Arkansas area for about 25 years and was one of the headliners on the stage of the Arkansas Opry, which was based in Jonesboro, AR for a couple of years in 1983-84. Bill released a new CD in 2000. It contains all original material, with one song co-authored by his wife, Francie. The album is called As the Eagle Flies. The music ranges from Rockabilly to Country and features a great group of musicians. Playing fiddle, acoustic guitar, and bass is Timmy Crouch of Strawberry, AR. Crouch has played for Ricky Skaggs and now does studio work and plays on the Grand Ole Opry for other Nashville notables. On the acoustic slide guitar, electric bass, pedal steel guitar, and lead guitar is Robbie Springfield. David Creech, formerly of the gospel group,The McGruders, plays drums, lead guitar, and keyboard on the album.